The order collectively referred to as mistletoes is incredibly diverse. They range in size from rather large trees down to little more than a couple leaves, barely recognizable on their hosts. Even more unique are the mistletoes that have foregone much of what we would readily recognize as an actual plant. 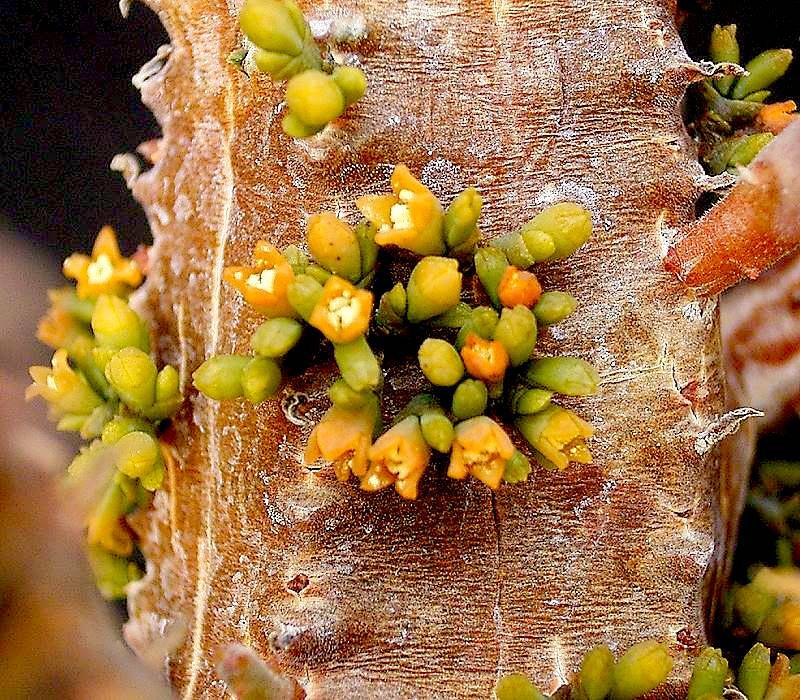 These parasitic plants have adopted an endophytic lifecycle, living their entire lives within the vascular tissues of their host plants, only visible to observers when in flower. Tristerix aphyllus is one such species. Its hosts are cacti in the genus Echinopsis (formerly Trichocereus) native to Columbia and Chile. Being an endophyte, the majority of this mistletoe lives as a mycelial-like network of filaments that wrap around the vascular tissues of the host cactus. The only part of the mistletoe that ever emerges are the flowers. They come in both red and yellow forms. What may appear to be lovely cactus covered in red flowers are actually the flowers of Tristerix. Strangely enough, the occasional small leaf is produced on the flowering branches. Though there is chlorophyll in the leaf, researchers believe that they perform little if any photosynthesis. This is not a parasitic relationship that is unique to cacti either. Africa has its own endoparasitic mistletoe as well. However, as we have discussed before, Africa does not have any native cacti (http://on.fb.me/1zPbac7). Instead, through convergent evolution, plants in the genus Euphorbia have followed similar adaptive trajectories. As such, at least one species of African mistletoe has followed suit. A species known scientifically as Viscum minimum finds the cactus-like Euphorbia horrida and E. polygona to its liking. Like Tristerix, Viscum minimum is endoparasitic, living entirely within the tissues of its Euphorbia host until it decides to flower. It too produces brightly colored berries that aid in its dispersal to a new host. The main seed dispersers are birds. After consumption, a bird either regurgitates the embryo or passes it out the other end. If that bird happens to be sitting on a host cactus or Euphorbia, the embryo will grow into a seedling that quickly taps into its new host and begins its internal parasitic life. It will not be seen again until it flowers. Viscum minimum beginning to set seed.